Stotra is a tiny shop we found in CR Park that's a treasure trove for all kinds of diverse goodies. It's got crafts from all over, and if you're looking for unique gifts or stuff for your home, you have to check this place out. Right opposite Market Number 2 in CR Park, they've got a nice mix of products. 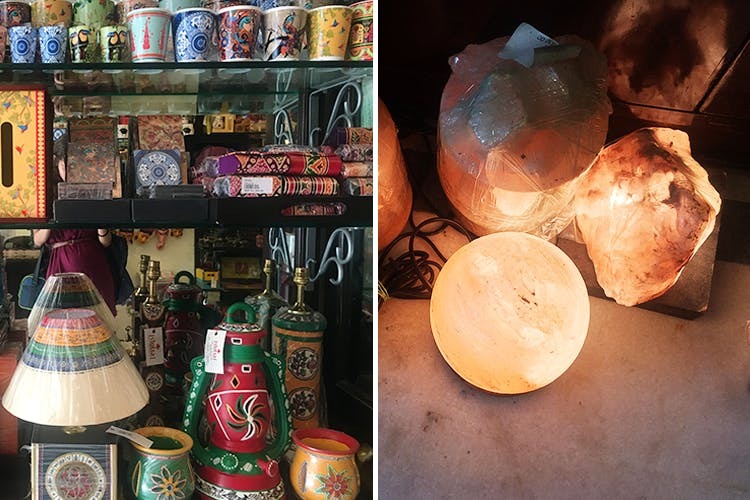 They've got handmade products from all over, like painted pots, kettles, salt lamps , terracotta lampshades, jute bags from West Bengal and organic pickles and teas and skincare products too. We found chemical-free incense, stationery made from elephant poop (yes, that's a thing), antiques, mini sand clocks (with purple and green sand) organic cosmetics from Jharkhand, brightly-painted tapri chai glasses, Dhokra craft from Bengal and so many other things. We loved the little painted autos, pretty diaries and jute lamps, but honestly, you just have to go there and check out the products for yourself. With a passion to save dying crafts, the store's more like a treasure trove for artisanal products. The owners work with craftsmen from all over the country and contribute a portion of Stotra's earnings towards their welfare. They have lots of organic products too, and an Ayurvedic doctor offering free check-ups in the evening. If you're hunting for cool home decor items, a special gift for someone or you're just really into handicrafts, you'll definitely find something to take back home here. We wish we could order online. If you live nearby, they deliver products to you (but call and check with the owner first).